If there is one fashion item that I couldn't be happier about coming back into style, it's the denim skirt. It is a must have this spring/summer, and if you don't have one in your closet, I highly suggest that you go add one now. Even though the denim skirt has made a recent comeback, in my opinion, it is a true classic and never really went out of style. That is why I've had this denim mini in my wardrobe for several of years now. It's an item that I know I will keep reaching for over time. The only problem is, it's a tad on the short side. It's no secret that I like to wear short skirts and dresses, as my legs are my best asset, but each time summer roles around, I find myself asking if I am too old to wear certain items. I am in my mid (okay late) thirties now, so when do I start dressing "my age"? Whatever that means. Then in dawned on me. That is what style is all about. It's taking and item or trend, and making it work for you. I work out, a lot. I work hard on my legs, so if I want to show them off, I will. I just have to do it in a way that is age appropriate. I probably don't have too many more summers left where I'll be rocking a mini, but until I am ready to retire it, I will wear it with confidence. So here are my tips for wearing a mini skirt in your thirties. 1. Make sure that you can bend over. Okay, this goes for every age. But having young children, I'm constantly bending down, or playing on the floor. If you're going to wear a mini skirt, you need to know how to bend, sit, and move in one without exposing anything. If you can't simply bend down and pick up a pencil without your bum hanging out, then it's too short! And always, always wear undergarments. 2. Wear the right proportions. You will never see me walking around town wearing a mini skirt with a skimpy tank top. If I am going to be showcasing my legs, then then my upper half will be covered. Pair a mini with a classic blouse or a high neck tank. 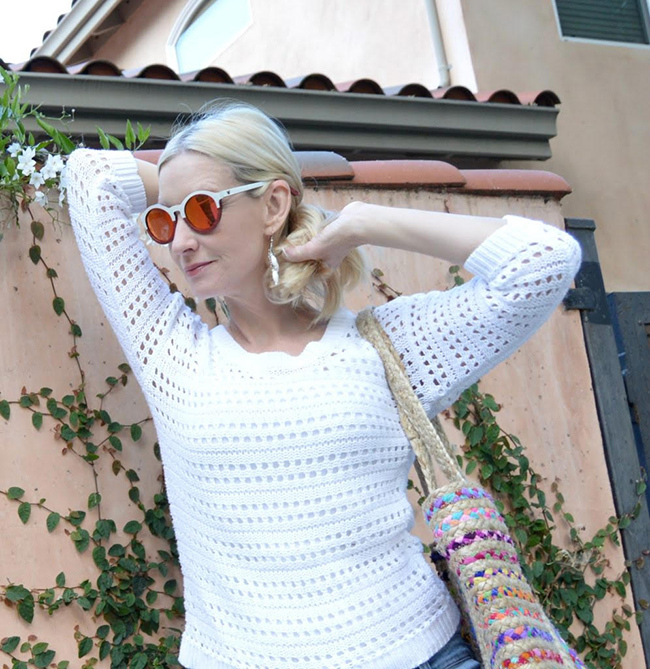 This white crochet top is the perfect example. I love the feminine and conservative touch it adds to my denim skirt. 3. Wear low heels or flats. A high heel is just going to make the skirt look shorter, so wear a low heel or flat instead. It tones down the skirt, and adds a more relaxed feel. 4. And if all else fails, save your mini skirts for the beach. I love wearing short skirts over my swimsuits, as they make the prefect cover ups. After all, everyone else is in a swimsuit and bikini, so those mini skirts appear more covered up! 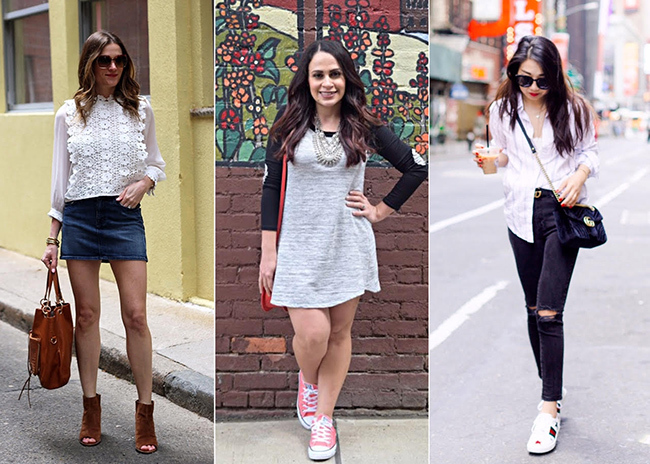 Since my skirt is no longer available, I linked some great denim skirts below. I'm probably going to get this one, here, and it's on sale! Also, my top is sold out in the white. I know bummer. But it is still available in black! *This post contains sponsored content and affiliate links. All thoughts and opinions are my own. Thank you for supporting the brands that I love here on Threads for Thomas. The feature blogger is Dawn Lucy of Fashion Should Be Fun. How cute are her two tone sunnies, and I'm loving her over 40 style. Make sure to visit her blog and say hello! I think we should all wear whatever makes us happy no matter our age. While I'm much younger I did give up all my denim minis after my first baby as they were very very mini, haha. Not enough coverage when running around with a toddler! I would like a denim skirt, but in a longer length like my chambray maxi skirt. You look so nice. Great styling. Great tips Rachael, I couldn't agree with you more! I remember wearing denim minis in high school, it brings back some nostalgia for me! That top is so pretty!! I also love the denim mini skirt! You def. have the legs for it! I need to get my denim skirt out! That denim skirt looks amazing on you! You definitely have the legs for it! Love your top too! This look is chic & HAUTE all in one!!! Girl, as long as your legs look that good you can wear a mini... no matter what your age. Plus age is truly a state of mind anyway! Absolutely LOVING this look! 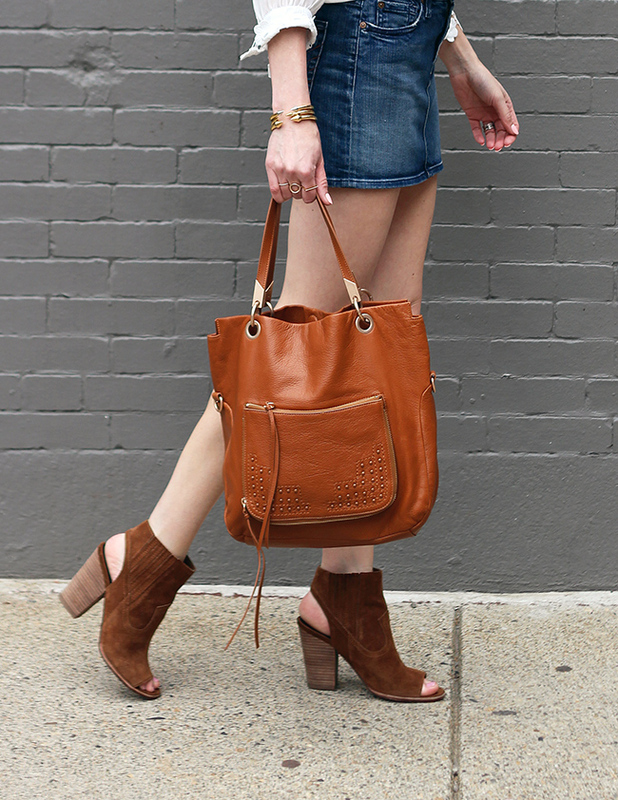 You rock the denim mini! That top is amazing! Love the details! Great tips and amazing look! Killing it in this mini. Love your top too! Happy weekend and thanks for the linkup! Love how you styled this outfit that top is amazing!!! 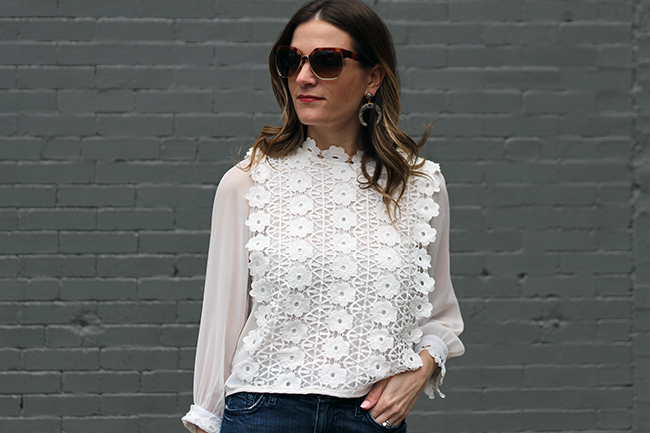 Love that lace top! And I am all about the denim skirt. I never gave them up when they went out of style. They are such great pieces and they go with everything! Love, love love rule number 2 -- it's all about balance! You're giving me inspiration to wear one, but it will have to be when I leave the kids at home with a sitter! These are great tips, Rachel! #4 is a great idea! Love how you've styled your skirt, striking the perfect balance with that pretty crochet top! Very nice look ... mixing different styles for a great result! this top is amazing on you!! This is such a great outfit. I love the top and the crochet detailing. Also that skirt with those heels totally works. And I agree about making "trends" age appropriate. Being in my mid 30s does not mean I need to count minis out. Also I wear cheer shorts underneath my dresses for those just in case happenings too! Such cute booties! Also love the white top. What a cute outfit! This white top is gorgeous! Loved this post!! Totally agree with you! these daisies are just adorable! love how you styled the skirt appropriate for our age! You're rocking that denim mini girl. So cute! Love the denim skirt! And your camel bag! I want a denim skirt in the worst way! These are some excellent tips for any age, in my opinion! Mini skirts - denim, especially - are some of my favorite pieces since I have long legs and it's fun to show them off. I definitely try to keep all this in mind when picking out the perfect ones! I'm with you on this one! It's all about the right proportions and of course, making sure you can bend down is a big one too, haha! Love this! Denim minis can really work for anyone when done properly! You just need to cover more on top! This whole outfit is so adorable! I love this entire look! Love that I saved my mini skirt from when I was in high school! I need to pull it back out and wait it again! This outfit is so chic and pretty! I love those booties! Love that mini skirt on you. I'm obsessed with them right now!! You are so beautiful!! I'm loving that white top! Denim minis have been so fun to wear this season! You look so adorable! I love that skirt on you! I'm SO glad that denim skirts are back in style! I used to ROCK them in middle school LOL! This look is adorable! You wear that denim mini beautifully!!! You make it look very chic and stylish and now I wish I never got rid of mine from high school/college lol. Great styling idea. That is a gorgeous denim skirt and so is the top! That top is gorgeous! I'm in my mid-20s but I don't see why anyone older than that can't wear lace. Gosh, I hope so! You are rocking this mini! You definitely have the legs for it and have styled it so well. Love that white top and your cute booties. loving those sunglasses! cute look! You are rockin' this look! love it! I love the fact that denim skirts are back in style as well! This one looks great on you! You look fabulous in the denim mini! I was too afraid to go mini this time around so I got a pencil skirt and I love it.